Heavens to Mergatroyd: They Found Too Much Johnson! Can there ever be too much johnson (snicker)? Two years ago I noted that Orson Welles had directed a movie that I declared at the time had the best title of any movie ever: Too Much Johnson. But the movie was believed to have been lost. Well I learned in the NYTimes today that lo and behold! they found Too Much Johnson! For generations, Welles scholars have been intrigued by “Too Much Johnson,” which would seem to represent Welles’s first real experience composing a film to be seen by a paying public, with the support of a professional cast and a professional crew. But for over 50 years, no print had been known to exist. 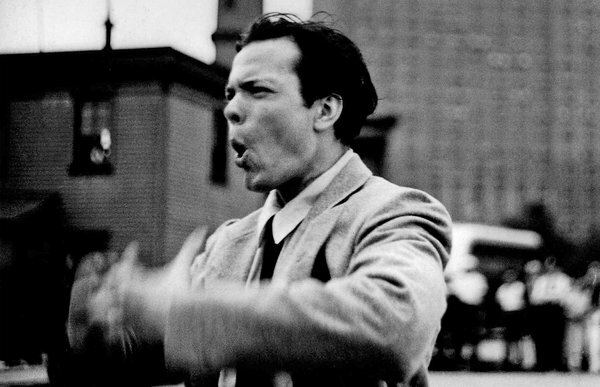 Welles never quite finished editing the large amount of footage he shot for “Too Much Johnson,” and when the show folded out of town, after a disastrous preview in Stony Creek, Conn., he set the film aside and forgot about it. Regrettably, while Welles was away for an acting job, a fire destroyed the villa and most of its contents. “Too Much Johnson,” which had been shot on highly inflammable nitrate stock, had apparently been lost to the ages.